Flavius Theodosius Augustus “The Great” (347- 395 CE) was the last emperor to rule over the whole Roman Empire. His success was probably due in large part to his habit of plundering Pagan temples for the gold he needed to pay his troops. But Pagan temples were a limited resource and Theodosius himself seemed to understand that when, shortly before his death, he partitioned the Empire between his two sons, Arcadius and Honorius. Afterward, the empire would never be united under a single emperor again. The Roman Empire had been a strong centralized power during its heydays, but it never was very interested in creating an ethnical and linguistic unity among its subjects. The Roman authorities understood that it was less expensive to tolerate diversity than to force uniformity — a typical policy of most empires. So, the Empire remained split into two main linguistic halves: the Latin-speaking Pars Occidentis and the Greek-speaking Pars Orientis. Theoretically, Latin was the official language but, in practice, the Empire remained a bilingual entity and, during the 2nd and 3rd centuries, the Roman elite would tend to speak Greek — considered more refined and classy than Latin. The split of the two sides of the Empire was not just linguistic, it was economic as well. The Pars Occidentis remained based on mineral wealth which, in turn, fueled the Empire’s military power. The Pars Orientis was more based on commerce and manufacturing and it exploited its favorable geographical position as the terminal of the silk road that connected China to Europe. During the expansion period, the military strength of the West made it dominant but, with the exhaustion of the gold mines in Spain, it lost the resources needed to pay for its oversized military apparatus. In time, the Western Empire became unable to control even its own territory and it squandered its remaining resources in huge border walls. It collapsed and vanished during the late 5th century CE. The Eastern Empire lasted nearly one millennium longer but was never able to rebuild the power of the old Roman Empire. Fast forward to our times, and it is clear that the American Empire is facing the same situation that the Romans were facing around the 2nd century AD. Like the old Western Empire, the American Empire’s economy is mainly based on mineral resources: crude oil in particular. But, with the gradual exhaustion of these resources, the empire cannot afford to dominate the whole world anymore. Emperor Trump seems to have an uncanny ability to understand the situation, even though he may not be an expert in Roman history. His actions are perfectly understandable in light of the plan of splitting the empire into two halves. One half (Pars Occidentis) will still be dominated from Washington, the other half (Pars Orientis) will have Beijing as its capital. The Western Part will retain the original Imperial language, English. The Eastern Part may switch to Chinese. Consistently, Trump is planning to abandon Afghanistan and also Syria, both too far and too expensive to defend and he also was not interested in an all-out confrontation with North Korea. But he seems to consider South America as part of the Western dominion, so he is moving to take control of Venezuela. Trump is also acting to destroy the hegemony of the dollar as world currency. Apparently, the idea is that the Western Empire is safer from financial disasters if the dollar becomes the Western currency only. So, the economic sanctions enacted against Iran, Russia, and other countries are forcing the Eastern Empire to develop new currencies and financial systems independent of the dollar. Clearly, Emperor Trump is facing strong resistance. Just as many Roman Emperors, he not completely in control of the Imperial military apparatus and a sizeable opposition is trying to maintain the American Empire alive in is most extended and expensive form: dominating the whole planet. But the direction is clear and the situation is simple: an Empire can only be as large as it can afford to be. The gradual depletion of the mineral resources and the increasing costs of pollution are making a global empire impossible. The Globalized World Empire was a beautiful creature as long as it prospered, but it was burning the dynamite stick at both ends. The time of global dominance is gone and the Empire is now in a convulsive phase: retreat is the most dangerous military maneuver and it is best executed maintaining an aggressive posture. Which is exactly what Emperor Trump is doing with his threats of war. But it is also true that the game of chicken is the second most dangerous game known (the first is the Russian Roulette). So, the retreat of the Western Empire may not involve just a rapid Seneca Collapse, as it was the case for the old Roman Empire, but a final blast of fireworks in the form of a nuclear war which would end civilization as we know it. Not pretty, but that’s the way things are. There remains one point of contention: is Western Europe in the Orientis or in the Occidentispart of the Empire? Surely, Britain tends to remain part of the Western Empire because of its linguistic ties with the United States. But the non-English speaking parts of the former EU don’t have this link and they have strong – practically unbreakable – ties with Russia as an energy supplier. So, they might become part of the Eastern Eurasian Empire. It seems that Trump understands this point very well, too, and it is in these terms that you can interpret his lashing out at the NATO allies at last year’s G7 meeting. 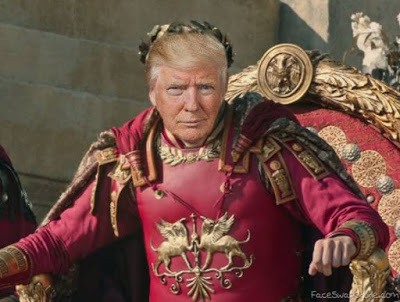 Trump’s message to the states once forming the European Union was simply, “Sorry, fellows, we can’t afford to defend you anymore unless you pay us more money than you can afford to pay.” In this sense, Western Europe could play the role of Britain and Dacia during the 3rd and 4th century CE, abandoned by the central Roman Government and left to fend off by themselves against the barbarian invaders. Who knows? History rhymes again and we might even have a new King Arthur. And you may also be interested at how Theodosius’s daughter, Galla Placidia, managed to keep the Western Empire together even without plundering temples. The story is here.